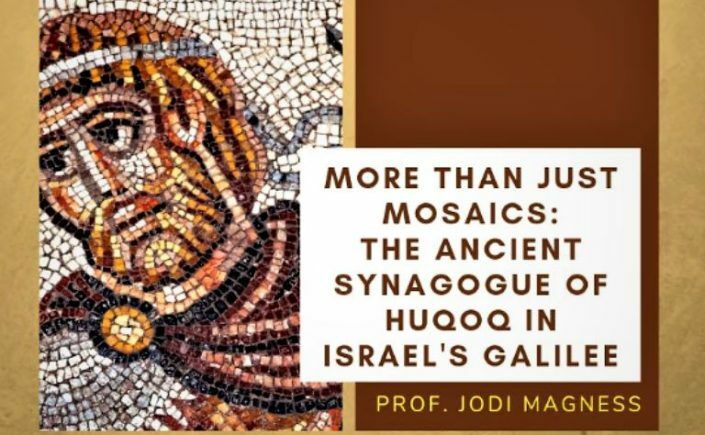 Since 2011, Professor Jodi Magness has been directing excavations in the ancient village of Huqoq in Israel's Galilee. The excavations have brought to light the remains of a monumental Late Roman (fifth century) synagogue building paved with stunning and unique mosaics, including biblical scenes and the first non-biblical story ever discovered decorating an ancient synagogue. In this slide-illustrated lecture, Professor Magness describes these exciting finds, including the discoveries made in last summer's season. 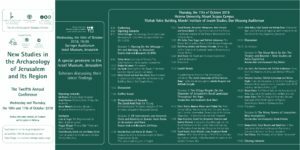 The ICS NYC Lecture is co-sponsored by the Department of Theology and the Program in Jewish Studies at Fordham University. ICS a Fabulous Forty in 2019! 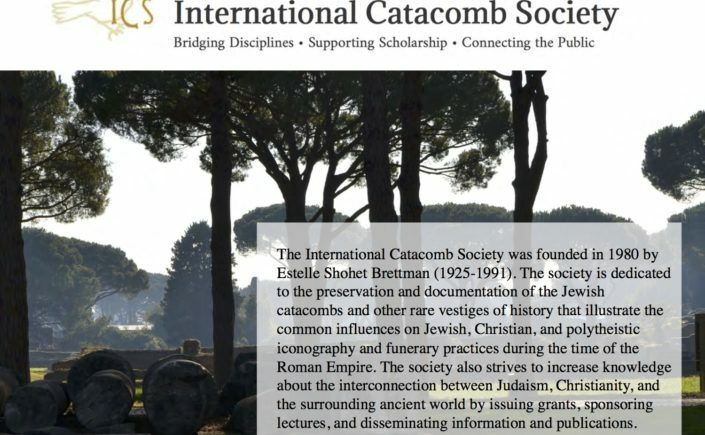 The International Catacomb Society strives to increase knowledge about the interconnections between Judaism, Christianity, and the surrounding ancient world by issuing grants, sponsoring lectures, and disseminating information and publications. The attached brochure (in pdf) gives the essential information (a bird’s-eye view) of the work that the society does and the goals we would like to set for the future. 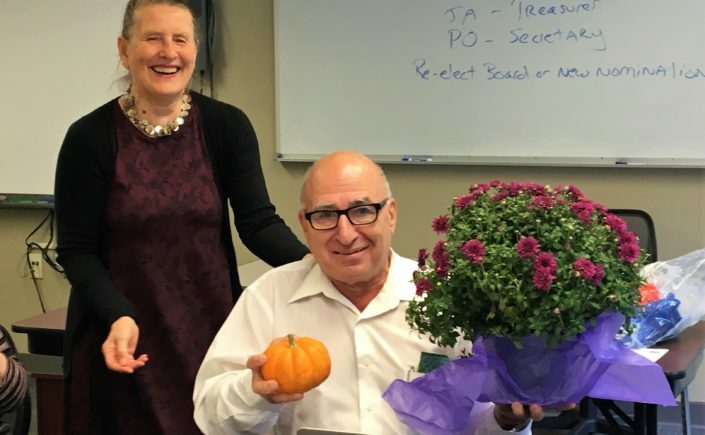 We have a stellar team of professional board members and advisory board members that is truly international with colleagues from the US, Germany, Israel, Italy, the Netherlands, and the UK: http://www.catacombsociety.org/who-we-are/. We are looking for additional resources to grow our program of annual research grants for scholars. The last 18 years of research projects are listed in the brochure and on our website. A gift in any amount will help with the worthy projects that we are sure to receive in 2019. 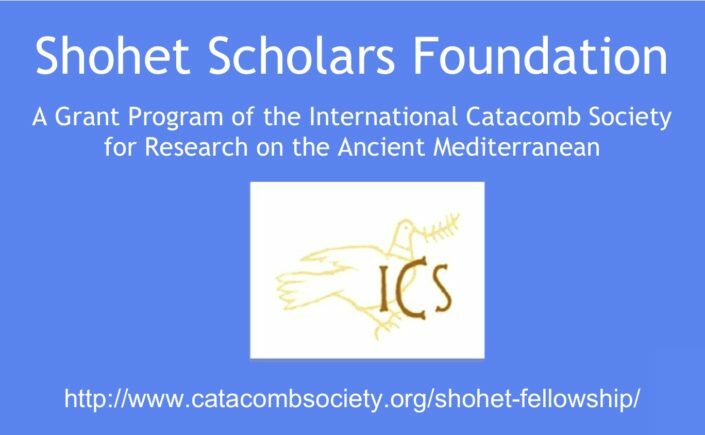 Should you wish to fund one or more of these projects, the ICS is happy to arrange for one of the grants to be entitled in your name or in honor of another individual. With many thanks and all best wishes for 2019. The next Estelle Shohet Brettman Memorial Lecture will be held on Sunday, December 2nd, 2018 in the Remis Auditorium in the Museum of Fine Arts, Boston. This year's lecturer will be Bert Smith, Lincoln Professor of Classical Archaeology and Art at Oxford University. 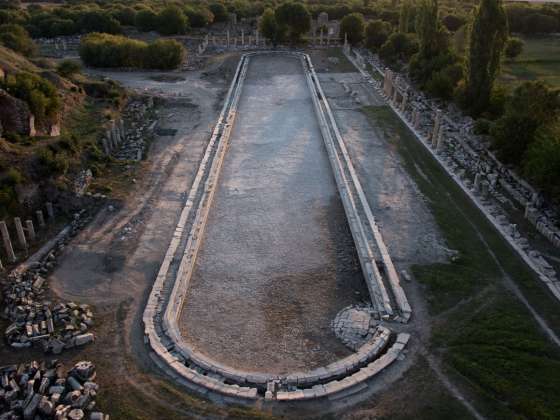 Aphrodisias is one of the best-preserved Greek-Roman sites in modern Turkey. The city was famous for its cult of Aphrodite and its marble sculptors. Recent work has uncovered an urban park with a 170-meter-long pool at its center. Its excavation has revealed the pool’s long life, from the 1st to the 6th century AD, as well as astonishing remains of high-quality statue monuments. Dr. Smith has directed the excavation and research of the site since 1991. Location: Harry and Mildred Remis Auditorium (Auditorium 161), Museum of Fine Arts, Boston. 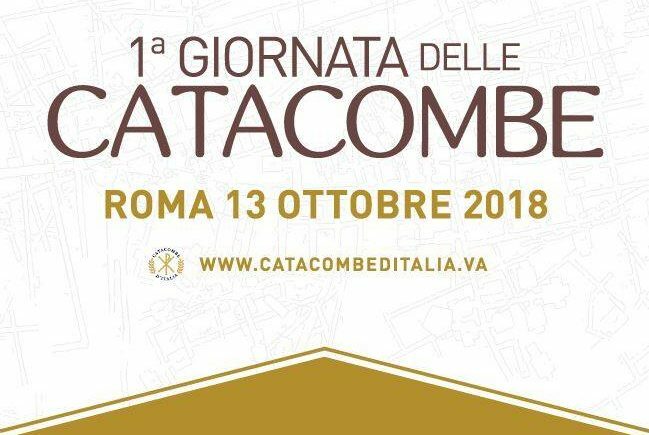 The Pontifical Commission of Sacred Archaeology, the Vatican office responsible for the study, maintenance, and upkeep of underground cemeteries, better known as "catacombs", maintained by tradition as Christian cult sites, in collaboration with the Vicariate of Rome's Pilgrimage Office, is sponsoring a "Catacomb Day" on Saturday, 13 October 2018 (during festivities in Rome for Pope Paul VI's canonization on Sunday, 14 October 2018). 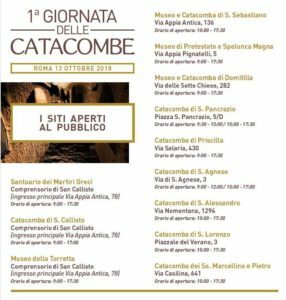 In addition to free admission to all the catacombs open to the public (new in 2018 is the re-opening of those at San Lorenzo), special thematic tours, workshops, and concerts, also free of charge, will be held throughout the day at many catacomb sites. 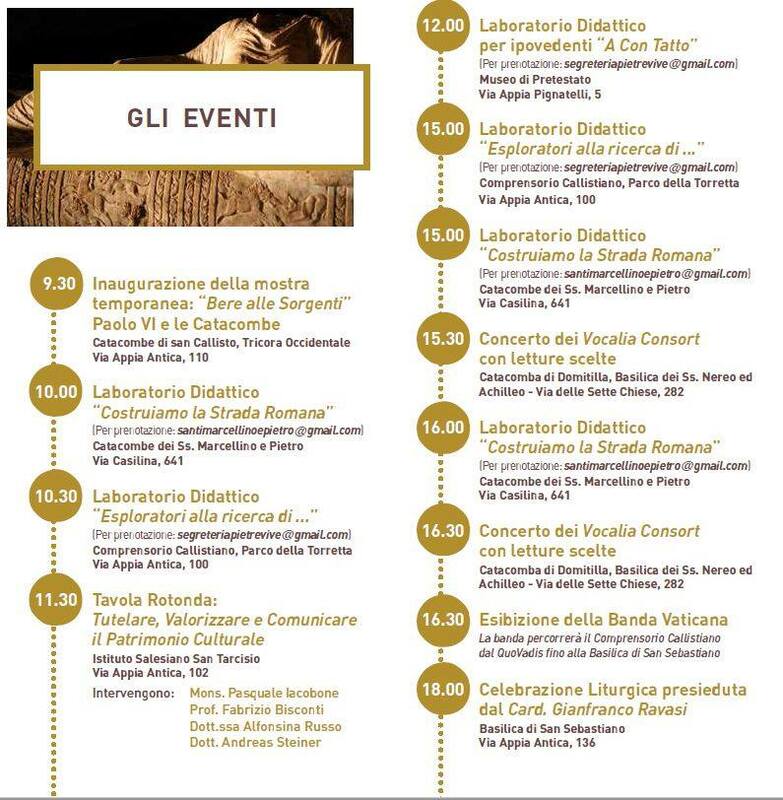 The event series will open with the inauguration of an exhibit in honor of the new Saint Paul VI, “Bere alle Sorgenti”. Paolo VI e le Catacombe, in a renovated mausoleum above the Catacombs of Callisto, and conclude with Mass in the Basilica of St. Sebastian's on the via Appia Antica, presided over by Cardinal Gianfranco Ravasi, President of the Commission. 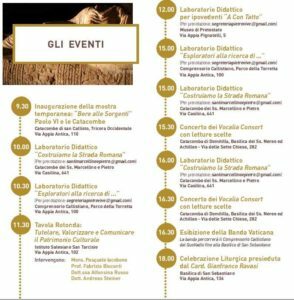 Shortly before the Jewish New Year 5779, the non-profit Fondazione per i Beni Culturali Ebraici in Italia ("Foundation for Jewish Cultural Heritage in Italy"), with the financial support of the Cav. 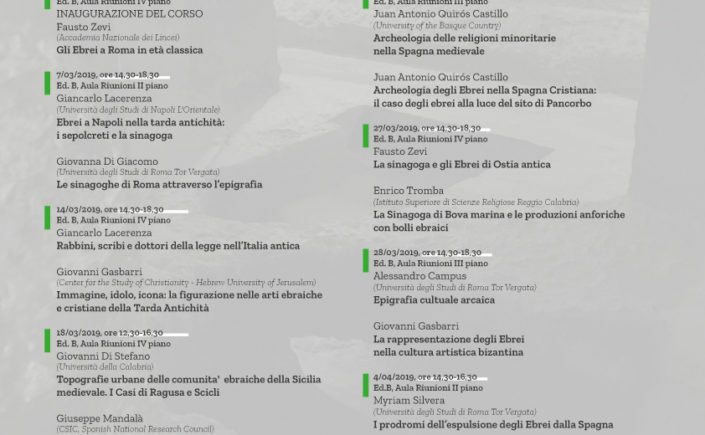 Guglielmo De Lévy Jewish Foundation, launched a new web portal for Jewish museums, monuments, and cult buildings in Italy from Antiquity to the present. Available in English and Italian as "Visit Jewish Italy", the website is especially handy for travelers with its mobile-friendly template and indexes of Jewish sites by location and type (such as cemetery, synagogue, Kashrut services, and museums). Scrolling down, the user can interact with the site by browsing destinations or listings of a specific feature. The template is rich in images and interactive maps which lead to short descriptions of each site with address, visiting hours, and contact information. As a test run, we selected, at random, the location of "Marsala" in Sicily, where Jews are likely to have settled in Roman times and where a documented Jewish presence is known in the fourteenth and fifteenth centuries before the expulsion of Jews from Southern Italy in 1492. The landing page for Marsala is dominated by several images of the historic Jewish quarter. Clicking on the "Discover" button, we arrive at a page with a Google map of the area. 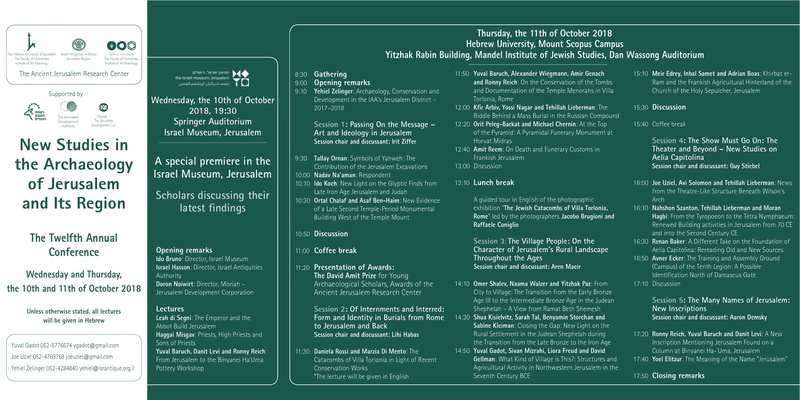 A small button marked "Preview" brings up a summary of the preceding page, but clicking on an unlabeled image at far left opens up a much more detailed itinerary of Jewish Marsala, locating a synagogue, cemetery, and mikveh, as well as city museum collections, the Flemish Tapestry Museum and “Baglio Anselmi” Archaeological Museum, which exhibit Jewish-themed items. This kind of information is what we were really after, but we only came across it by accident, clicking on a picture that turned out to be a hyperlink. It would be helpful to re-tool this feature so that people know where to look and how to arrive at these nicely-detailed guides. Our next stop is Rome, with far more listings in all the categories. At this point, we understand that by clicking on the picture, we will get the guide. In the example of Rome, however, in light of its sizable Jewish community of today and clear evidence of very ancient origins, it is a hard to figure out what makes the FBCEI list as a "Jewish" cultural good. Some of the modern synagogues are listed, like the Great Temple and Di Castro Oratory, but not all of the Jewish centers of worship and community in Rome (because they are not historic enough, or belong to specific movements within Judaism on a global scale, like Chabad Lubavitch and Reform?). The archaeological remains of the Jewish catacombs of Vigna Randanini and Villa Torlonia and Synagogue at Ostia Antica are listed, but not state and church museums which hold artifacts from these ancient Jewish sites and others (a short list would include the Vatican Museums, the Capitoline Museums, and National Museum of Rome). The absence of museums is not because they are not directly overseen by the Rome's Jewish community, for the Arch of Titus is listed on the site, and it is not even a Jewish monument, as intended, though it has come to symbolize to some the modern Jewish State. 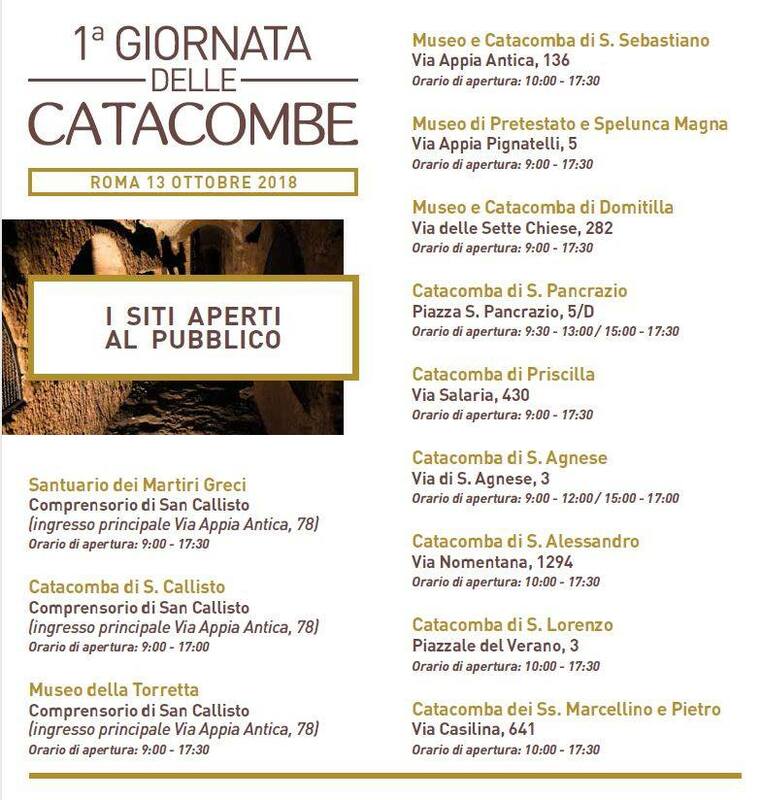 Given the difficulty and expense of visiting Jewish catacombs, that do not yet have public opening hours, this oversight should be corrected, with the addition as well of the locations of various Hebrew and other Jewish manuscripts and documentation in Rome collections and archives, also essential testimonies to Rome's Jews (maybe, too, specifying which Jewish treasures are in the Vatican's possession - quite a list). 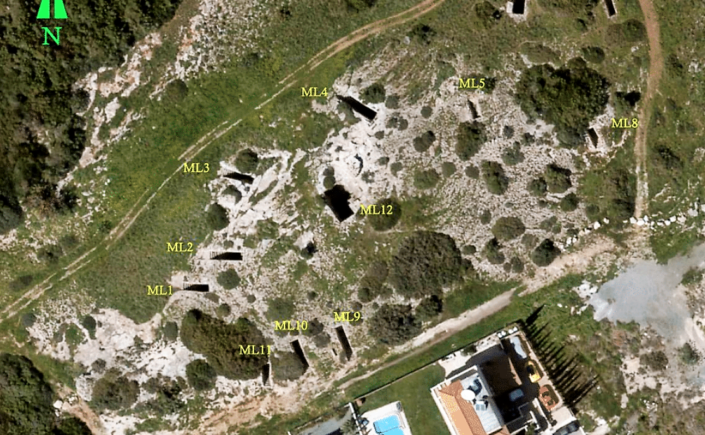 There are other sites we would like to see included in the geographical listings - Tivoli, for instance, also Bari, Taranto, Lavello, Fondi, Nocera - even if the location of many of their Jewish buildings and cemeteries is not certain, there is the certainty that they were there, and local museums preserve some traces (for if Agrigento is included for this reason, then why not also Comiso?). To many, we must seem overly critical, and nit-picking like this is perhaps demanding too much. Yet a web portal is in essence an interactive and fluid means of communication, that should be periodically updated and fine-tuned to reach as wide a public as possible. 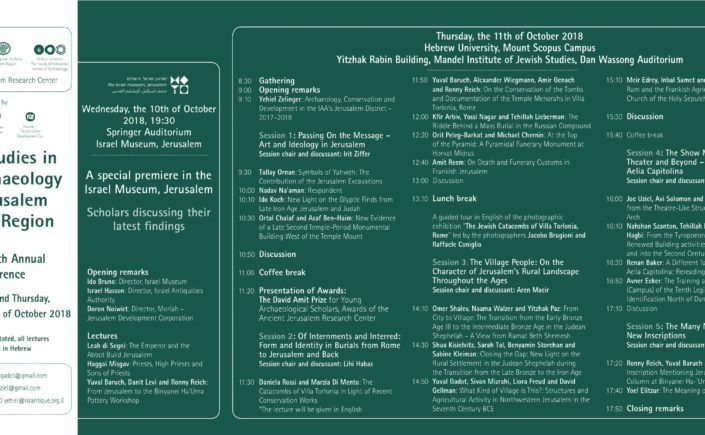 "Visit Jewish Italy" is on a quest for perfection in this affair - freely defining itself as a "work in progress", and lively public engagement and constructive feedback will be the most important measures of its success.